Total of 108 Fluid Ounces! Available for daily, weekly or monthly rentals and refilled as needed by CALLAHEAD. Providing adequate hand washing facilities is the responsibility of every employer, special event planner or host. CALLAHEAD realizes portable sinks are not always an option for every construction job site or special event, which is why we are pleased to present the ANTISEPTIC STAND as a sanitizer alternative. Our ANTISEPTIC STAND is an ideal public health solution, killing 99.9% of germs and bacteria that can cause life-threatening illnesses when soap and water is not available. This 60” tall unbreakable polyethylene stand holds four (4) dispensers that are just 43” off the ground with each dispenser filled with 800 ml of disinfecting foam. Maintained and refilled by CALLAHEAD, this antiseptic system is perfect for large job sites, events or high traffic public locations, offering peace of mind that you are promoting healthy hand sanitation. It is strongly recommended by the Center for Disease Control (CDC) that you wash your hands every time you use the restroom, to avoid contact with harmful germs and bacteria that can cause serious illness. Due to scientific studies confirming clean hands will protect from serious illnesses, CALLAHEAD strongly recommends that every portable toilet be accompanied by a handwashing or hand sanitizing system to encourage proper hygiene for your employees and guests. Just a pump of foam and rubbing your hands together, our quick drying sanitizer will protect users from harmful diseases and infections that are commonly spread through hand-to-hand contact. The ANTISEPTIC STAND is the ideal solution for construction job sites, as well as any public location serving food such as festivals, farmer's markets, super markets and outdoor food vendors, to protect from contracting E.coli and salmonella poisoning. Children are particularly at great risk of passing dangerous illnesses making the ANTISEPTIC STAND essential at schools, daycare facilities, amusement parks, petting zoos, playgrounds, birthday parties, graduations, bat mitzvahs’, communions etc. The good health of our society is a priority to CALLAHEAD, which is why we offer such a wide variety of portable sinks and hand sanitation systems to accommodate every need. We believe you can never be too cautious when it comes to your health and protecting yourself, employees and guests from illness. 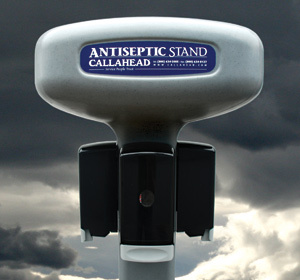 Our ANTISEPTIC STAND is just one of many options available from CALLAHEAD. We offer such a wide variety as our effort to ensure our clients job site or special event will be a sanitary one. The Center for Disease Control (CDC) affirms, “Keeping hands clean is one of the most important steps we can take to avoid getting sick and spreading germs to others.” • The Occupational Safety and Health Act (OSHA) require employers to provide adequate washing facilities for employees that work with contaminants that may be harmful. • The Association for Professionals in Infection Control and Epidemiology (APIC) position, “Although people usually think that germs are spread through the air, the fact is that germs are most easily spread through HAND CONTACT.” And, “One of the best ways to avoid getting sick or spreading illness is to wash OR to decontaminate your hands.” • The Center for Construction Research and Training (CPWR) states, “Lack of cleaning facilities on construction job sites increases the likelihood of dermatitis, caustic burns from extended contact with wet cement, or acid burns from muriatic acid or other hazardous agents that come in contact with the skin, and infection.” The result: additional workers’ compensation claims. • The Center for Disease Control (CDC) estimates that 36,000 people die from the flu or flu-like illness each year. Also as many as 76 million Americans get a food-borne illness each year and another 5,000 people die from food borne illness each year. Your best protection from these types of illness’ is frequent hand washing.